This entry was posted in 2015firstquart, BlueMoon, BMFA, shawls, WIPs, WIPWed and tagged knitting, shawls, WIPs by shoelaceswitcher. Bookmark the permalink. Ooooooooh so pretty…. I deeply covet this shawl also. You will love this knit. Loved it so much I am doing it twice, but only because I messed up on the needle size and had to rip out an almost completed shawl! LOL. I am a middle of the road. Don’t start a lot at one time, but like to have more than one item going. I usually cap it at 3. But now, let’s not talk about the perpetual WIPs that may never see the light of FO. HA. WIP Preservation mechanism… that’s pretty funny. And true. 😀 This is a beautiful pattern. It’s going to be gorgeous when you finish. It’s a beautiful shawl. For whatever reason cables scare me and I avoid them. I do miss out on allot of nice patterns though. I jump between being dedicated and distracted. Last week I cast on a tee just because I was bored with my socks and the monotony of life in general. I think I need this shawl in my life though, I can see why you have been drooling over it so long. I just finished one project: blocked it and immediately started itching for another. No matter that I have plenty of crochet projects which are languishing in bags. My excuse is that I NEED a mindless knitting project just on the go. So I started a skirt. That is guaranteed to take me ages! Wow, that is an amazing shawl. Don’t know how you’ve held off for so long! that’s going to be lovely! I tend to have at least a few projects on the go, some because of portability, and some for only ‘at home’. I’d love to have project fidelity, I feel like I’d finish my knits faster! I am generally a pretty dedicated knitter, sometimes to the point of joyless slogging. There is something inherently joyful and optimistic in casting on and sometimes it just the thing you need to raise the knitting energy again and actually finish that older project. 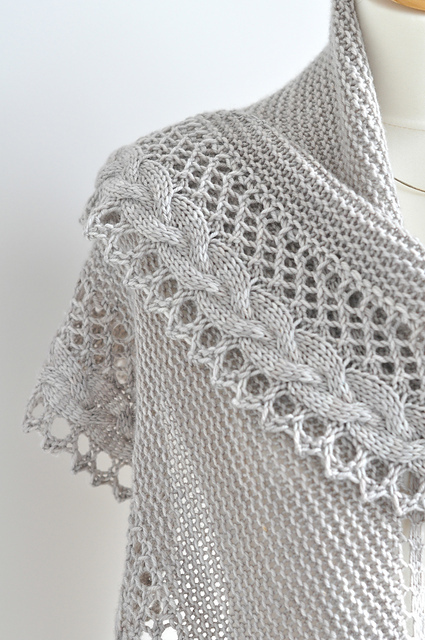 So cast on and be merry, it is a lovely shawl. Are you cheating on your vest? I’m with you on the French Cancan shawl. It is simple, but elegant. It’s not often a shawl can do both.